Embark on an EPIC adventure in virtual reality! In this cutting edge class, you will learn the foundations of VR design by creating your own virtual worlds, exploring simulated environments, and crafting memorable 3D experiences. At the end of the week, take home your first cardboard VR headset to show friends and family the new worlds you created. VR projects can be viewed on a website or a mobile device. 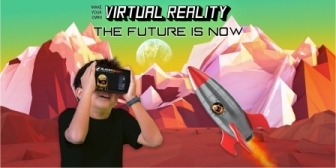 Students do not need a mobile device to take the class, but to use the VR headset at home a camper will need access to an Android or Apple mobile device. Students will work in pairs or teams and VR Games will be available on a password protected Black Rocket website to share with friends and family. Tuition includes an additional supply fee for the VR headset.